Pregnant with Twins? Start Here! When you’re a cat parent who has just found out that you’re pregnant, your thoughts may immediately turn to all the adorable YouTube videos of cats and babies cuddling. I couldn’t wait for my fur-baby to meet the twins! As someone who didn’t have a pet growing up, I was super excited that my girls would be growing up with a kitty and learning to care for and love animals. 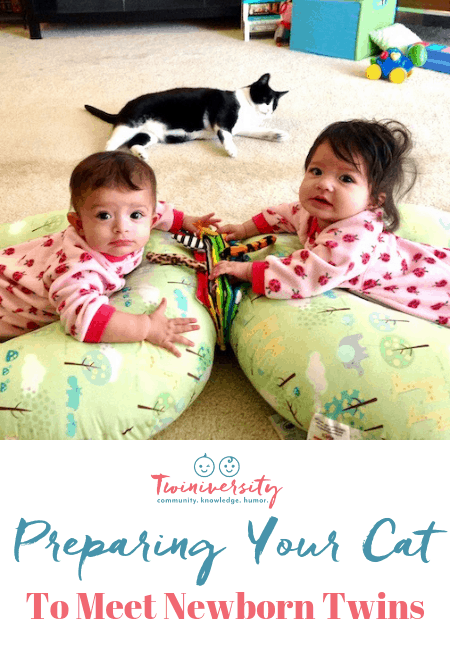 But to make sure that the cat(s) and the babies are safe and happy, it’s really important to start planning and preparing well in advance of bringing your newborns home. Here’s what I focused on to make sure that everything went smoothly. One of the unpleasant realities of being pregnant is having to consider everything in your environment that is potentially harmful. With cats in the house, you have to be aware of the risk of exposure to toxoplasmosis. It’s recommended to keep cats indoors (if they aren’t already) during the pregnancy because they can pick up the toxoplasmosis parasite and transmit it through their poop. This parasite can be very harmful if passed from a mother to her child. That’s why pregnant women are also advised to either have someone else handle litter box duty or to wear gloves while scooping/cleaning out the box. My OBGYN actually ran a toxoplasmosis blood test to be extra careful, so it is important to mention that you have cats to your doctor. I always like to think that my cat, Ripley, knew the girls before they were born. She loved curling up with me during the pregnancy and I’m sure she could sense it. I wanted her to be as comfortable as possible with such a major life change, and I had read that playing recordings of a newborn crying to your cat can help acclimate them for what’s to come (there are special videos online just for this purpose.) I did this for Ripley and happily she did not seem fazed at all. To be honest, I think I found the recordings more upsetting than she did! We also let Ripley investigate and sniff the baby furniture and car seats as we got closer to the due date. Anything that you can do to prepare your cat for the new sights, smells, and sounds is helpful. 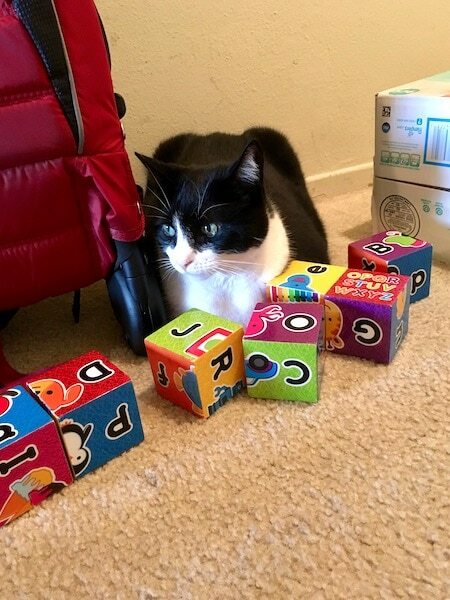 You may need to rethink the setup of your home so that your cat and babies are all safe and comfortable. It’s important to remember that your cat should NOT ever be where the newborns are sleeping. 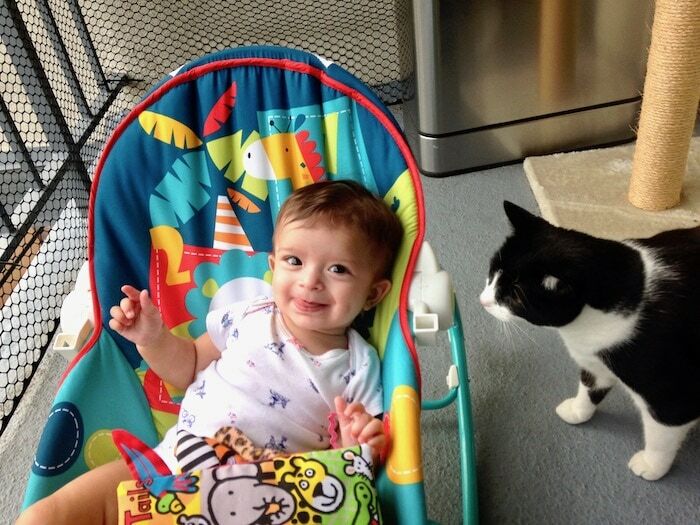 Cats may be tempted to cuddle with the babies and even get in their cribs. This is a suffocation hazard since newborns can’t turn their heads well. In our case, the door to the nursery was always shut when the girls were sleeping in there. It’s also good to plan ahead in case you have to move the litter box to a new location; this should be done in advance so that your kitty gets used to it. Also, if you are installing any baby gates, make sure that your cat can either get over or under them. Ripley is not a jumper, so we had to install them just low enough so that the babies could not get trapped underneath but with enough room for Ripley to scoot under. Before introducing your cat to the babies, it’s recommended that you let your cat sniff something with their scents on it, like swaddle blankets. And when that big moment comes, don’t get too excited. Ripley is a slightly skittish cat so when she first met the girls it really just involved some curious sniffing as they sat in their infant carriers. She immediately took to them though and has always wanted to be close (but not too close!) She was even a good sport when they first started crawling and following her around. 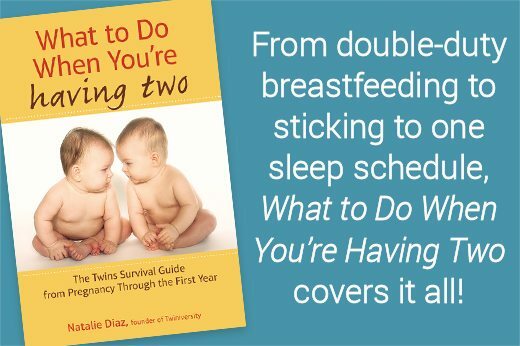 This sounds obvious, and this is the part where it’s way harder with twins. Your cat was used to getting all your attention, and that is definitely going to change when the babies are born. When you’re overwhelmed and sleep-deprived, your cat is the last thing on your mind, and she knows it. I used to be the one to primarily look after Ripley, but during my pregnancy, that role slowly shifted to my husband. As my kids have gotten a little older I’ve tried to make time, even once a day, to give Ripley the attention she’s been missing from me. This can range from a cuddle to playtime. The more attention and love your cats get, the fewer problems you will have. Even then, some cats do not accept change as well as others, and suddenly having two new humans in the house who are monopolizing all the attention can lead to stressed kitties (i.e., be prepared for cat pee). One of my concerns was how cat dander would affect my daughter with asthma. We had her allergy tested and confirmed there’s no cat allergy, so we have a HEPA air purifier in the girls’ room, and I make sure to vacuum regularly. Thankfully it has not been a trigger for her. If you suspect a cat allergy, you should consult with an allergist for testing and advice on how to best reduce allergy symptoms. 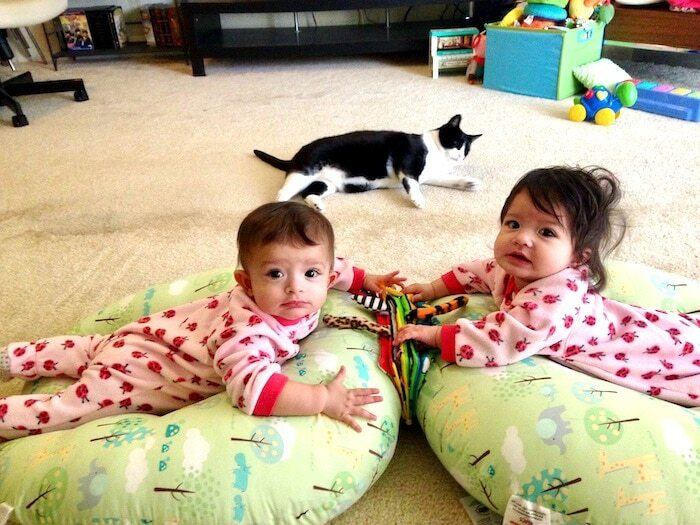 And now, to the most fun part – seeing the bond growing between your twins and cat. If you model gentle and appropriate behavior, your kids will learn how to respect and love your cat. The girls are 3 years old now and know to call Ripley over by extending a hand, and they’ve learned how to gently pet her and talk to her in quiet tones. Their newest job has been to offer treats to Ripley. And Ripley, who is by nature very shy, has slowly become comfortable with the girls and enjoys the attention. 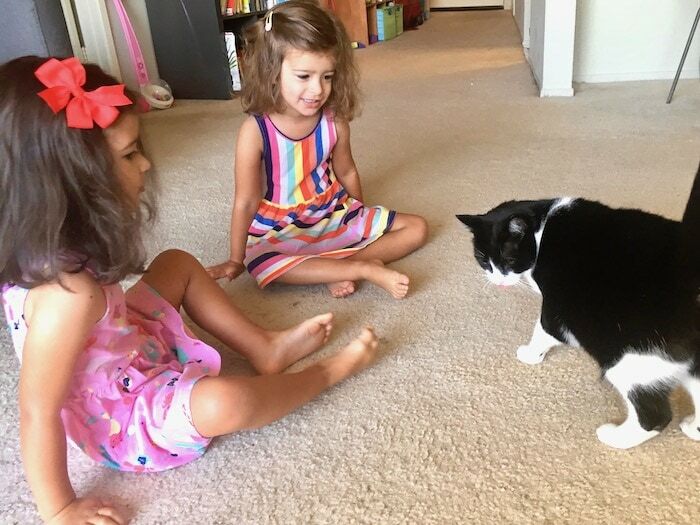 The girls absolutely love her and any other cats that they see. It is wonderful to see their growing empathy for and love of all animals. 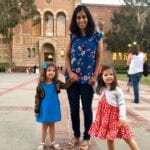 Lakshmi Hutchinson lives in Glendale, CA with her husband, fraternal twin girls, and tuxedo cat. In her spare time, she likes to go to concerts and her dream is to have time to read books again. Why Can’t We Adopt A Pet and Have Twins? Sign-up for our mailing list for weekly updates and to be the first to know about giveaways, contests, parties and more! Yes! In addition to the Twiniversity Mailing List, I’d like notifications of new posts daily. 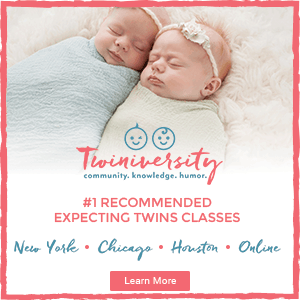 Some Twiniversity posts contain affiliate links. If you click on an affiliate link and decide to buy a product, Twiniversity gets a percentage of the sale, at no cost to you. 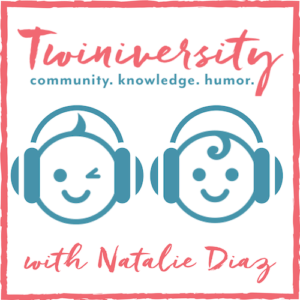 This allows us to keep Twiniversity.com free for our community. Thank you for supporting us! Copyright © 2017 Twiniversity. Site design by Lush Creative.